Hi I'm Tomomi, hive mama for October! This is my very first to do the quilting bee actually so I am very very looking forward to what I am going to get from you ladies! After nine month going through everybody else blocks, I was bit worried somebody may come up with the same idea as mine. But you didn't! So here you go! My idea came when I saw this beautiful room. We moved the house last November and got rid of a lot of books but still we have a lot. Yes we are a family of book worms. And now I want to have a book shelf quilt too. There are some variation of them if you google it, but since this quilting bee is working with scraps, I want to make something like this or this or this. I like being organised and my book shelf to be organized by genre. To do so, I would ask you to have a theme for each blocks you make. Grown up section, old books, pop section, Jane Austen section, future section, exotic, or whatever your books collections are. Just no kids section please. Pretty section, maybe. Only fabric I wouldn't want for the books are whites or very pale unless some bright pattern on it. I am going to ask you to use Kona Ash for the background, so if you can use anything brighter or darker than it, it's fine. Blocks size : 12.5” H and about 12.5” W. I need you to make them 12.5” high but the width can be between 11” and 13”. I will explain why later. And two blocks please. 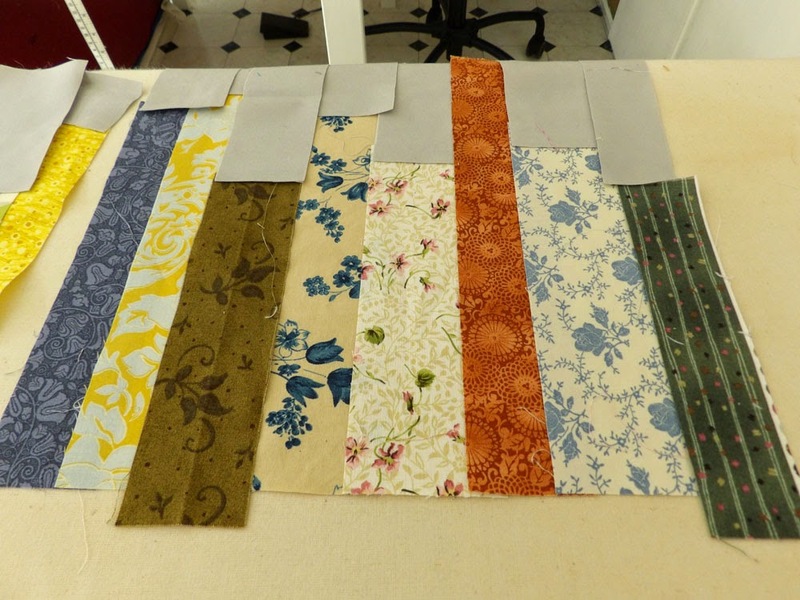 Cut up the scraps of fabric for book parts between 2.5” - 1” wide and 6.5” - 11.5” long. 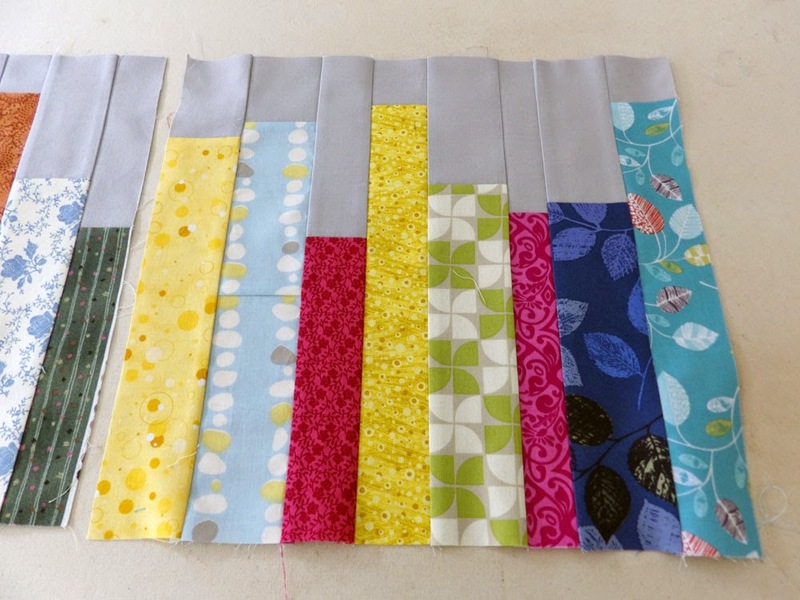 Add the necessary length of the Kona Ash as a background fabric on top of each strips to make them 12.5” long altogether. Fold the seam allowance to the book side together so the book gets some lift from the background. 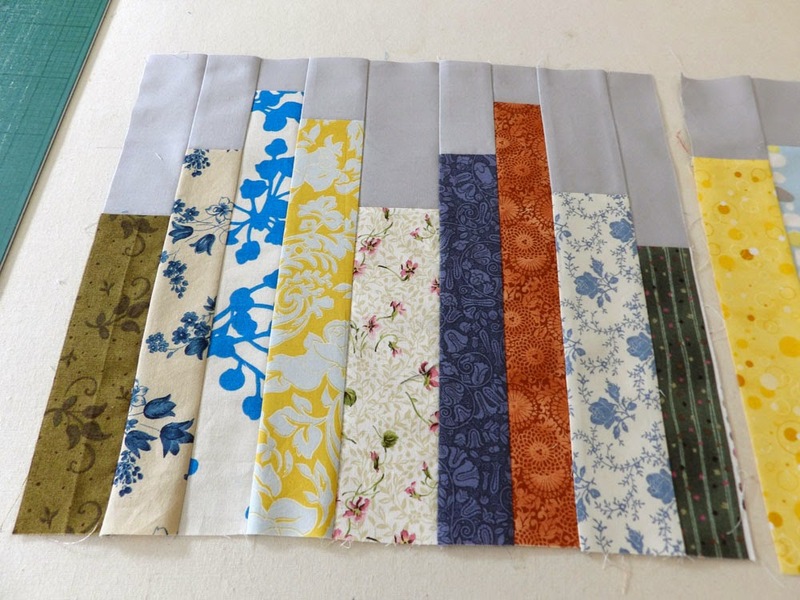 Stitch all the strips together to make a block about 12.5” wide. You don't need to make them exact 12.5” wide, shorter or longer, both fine. Please vary the hight of books especially neighbouring ones, means don't put similar hight books next to each other. 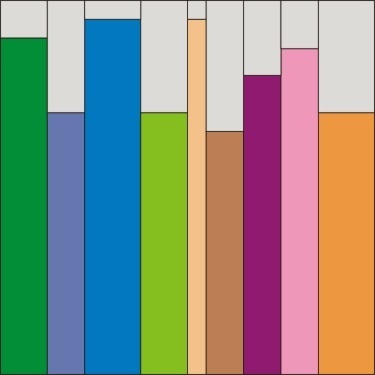 And wide colour variation please. 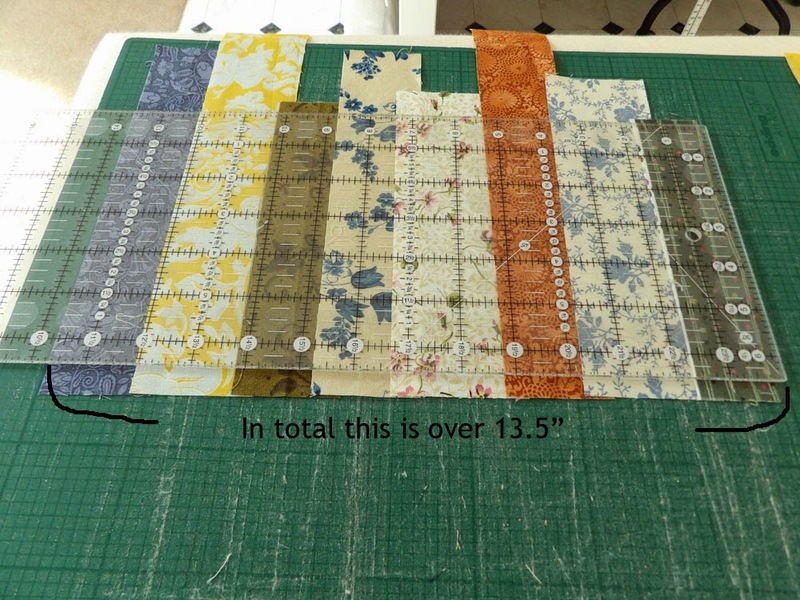 Cut up the scraps of fabric for book parts between 2.5” - 1” wide and 6.5” - 11.5” long. Lay them in order you like with 0.5” overlapping. 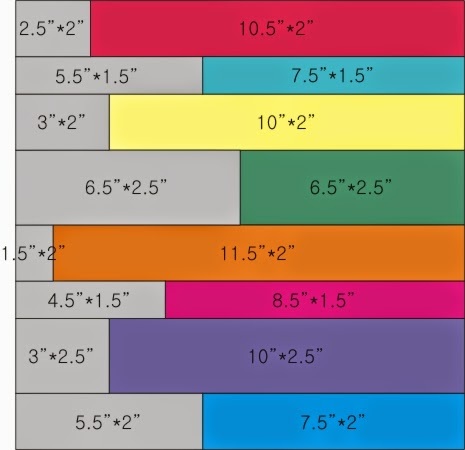 Measure and make the total width around 12.5”. I made mines a bit longer to be on the safe side because I usually end up too short. Cut one Kona Ash 2.5” wide strip for the background. 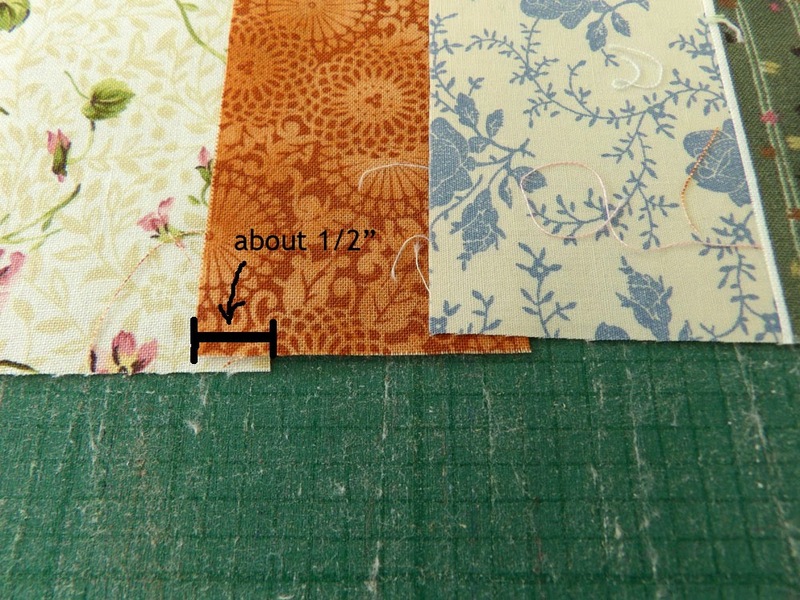 Measure the length of book strip which is 2.5”, say that was A”. Cut the Kona Ash strip to (13 - A)” long and stitch it on top of the book strip. That should make the strip 12.5”. Do the same to all the 2.5” books. Slice the left over 2.5” Kona Ash strip or cut new one to the same width as the next widest book strip. Repeat as above. And proceed to the narrower books. In this way,I Think you don't end up with too much Kona Ash scraps. When all the books has background attached on the top, stitch them together. Please verify the hight of books especially neighbouring ones, means don't put similar hight books next to each other. And wide colour variation please. Alternately, you can make them with this measurement. I wrote them in order to go together, so don't mix them up! Refert to the pic too. When all the books has background attached on the top, stitch them together whatever the order you like. The picture is sideways for me to draw easily. All the measurements are seam allowance included. Please contact me if you find something wrong or difficult in this tutorial. I will help!